Gippsland Lakes Community Health (GLCH) will celebrate National Volunteer Week (NVW) today by treating their volunteers to lunch in recognition of the outstanding work they do in our local communities. “National Volunteer Week provides us with an opportunity to celebrate our dedicated volunteers and let them know how much we value their generosity and commitment to our organisation and clients,” said GLCH chief executive, Sue Medson OAM. This years’ NVW theme represents ‘Give a little. Change a lot’ represents the profound impact volunteers have in their communities and on society, through giving a little of their time. At GLCH you can volunteer as much or as little time as you want, depending on your role. Once a week, once a fortnight, once a month – whatever suits the individual. “Volunteering is all about making a difference in your community and our volunteers truly do,” explained Ms Medson. “They are an invaluable asset to staff and our clients and make our services stronger. Last year GLCH’s social support staff, who coordinate social groups and activities were supported by a team of 24 volunteers. Over 12 months they logged a combined 3,200 hours, during which they cooked 11,500 meals and served 320 cappuccinos. 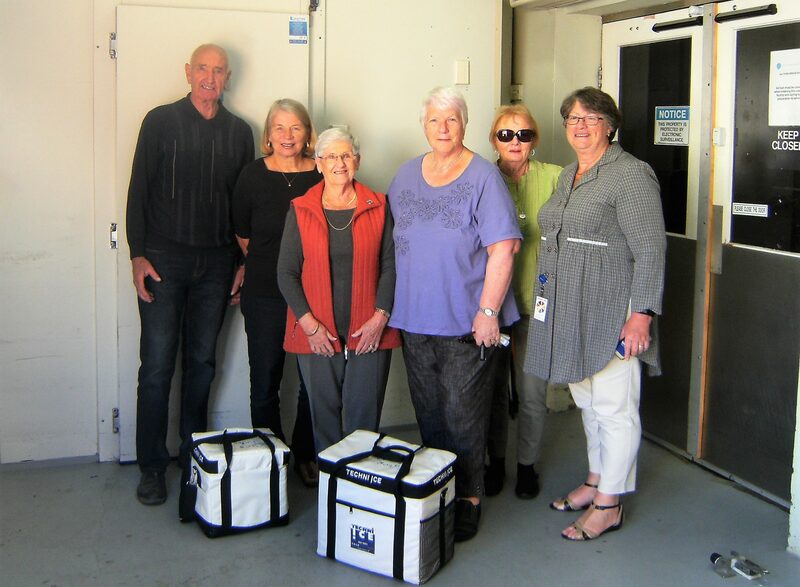 Their Meals on Wheels volunteers delivered just shy of 13,000 meals to residents of Bairnsdale, Paynesville, Lakes Entrance and surrounding towns; and their volunteer drivers escorted 109 clients to non-urgent medical appointments. Volunteering benefits you personally as it offers the chance to act on your values, passions and interests and make new friendships and create professional networks. Volunteers also enjoy better physical and mental health as studies show volunteering makes us healthier and happier. GLCH have a number of different volunteering opportunities available from their five locations in East Gippsland. To find out more about these opportunities, head to www.glch.org.au/get-involved/volunteer/ or contact the volunteer coordinator. Pictured before their meals on wheels delivery runs are dedicated volunteers Doris and Bryan Garrett, Heather Rose, Marg Porter and Margie Kavanagh with GLCH CEO Sue Medson (far right). 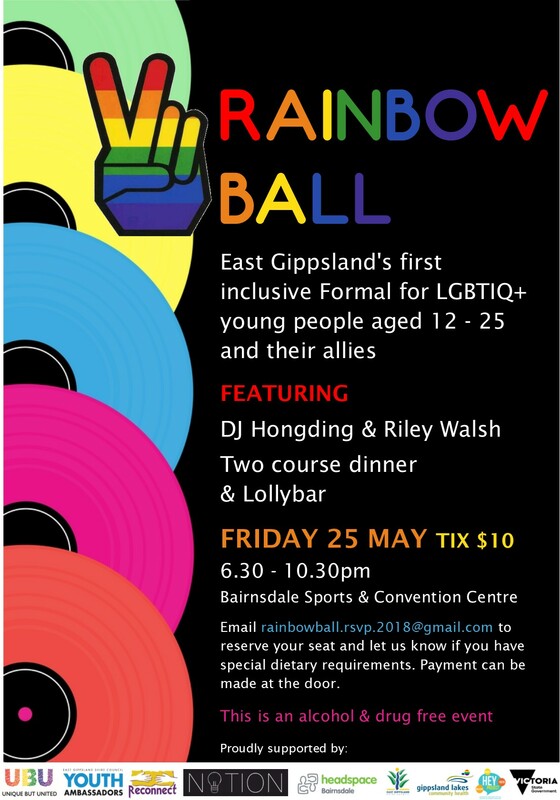 Funding from the Hey Project and the Victorian Government has enabled a group of enthusiastic young people to plan and host the Rainbow Ball – the first ‘inclusive formal’ in East Gippsland for LGBTIQ+ young people and their allies. Under the guidance of staff from Gippsland Lakes Community Health (GLCH), this project has given the young workgroup the opportunity to tackle event planning and management on a small scale and pull together a special night of celebration for their peers. In addition to the awesome food and entertainment, the workgroup has organised a Rainbow Lolly Bar, Photobooth and Body Artist. 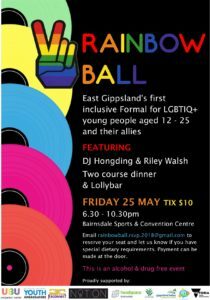 The Rainbow Ball will be held this Friday night in Bairnsdale and is strictly a drug and alcohol free event. As the theme of the event is ‘inclusion’, young people are encouraged to invite a friend or ‘ally’ so they feel supported during the evening. We’re going for Rainbow Tick! 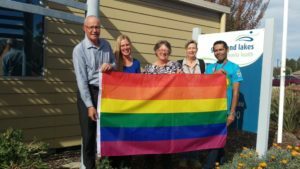 Gippsland Lakes Community Health (GLCH) is excited to announce they are working towards Rainbow Tick accreditation over the next two years. GLCH currently provide two LGBTI specific programs – a counselling service and the Healthy Equal Youth (HEY) project in partnership with headspace and local schools. They are also implementing the Australian Government National LGBTI Ageing and Aged Care Strategy and are making changes to their work practices to respond to the needs of older LGBTI people and deliver care that is sensitive and appropriate. The Rainbow Tick is awarded to organisations that demonstrate inclusive practice and service delivery for the Lesbian, Gay, Bisexual, Trans and Intersex (LGBTI) community. The Rainbow Tick consists of six standards against which services can be formally accredited. The six standards, or areas of focus, are: organisational capability; workforce development; consumer participation; a welcoming and accessible organisation; disclosure and documentation; and culturally safe and acceptable services. GLCH are putting a call out to the LGBTI community for input and advice, in whatever format suits the individual. Involvement and feedback could be in a variety of ways, from phone conversations or emails, to small group sessions or one-on-one. Consultation with the LGBTI community will be key in improving service delivery and we encourage anyone who would like to be involved to let us know – phone Marnie Graham. 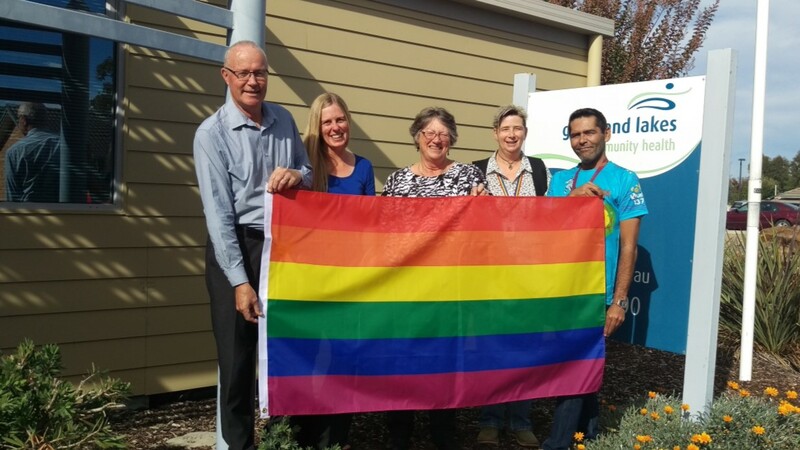 Pictured: members of Gippsland Lakes Community Health’s LGBTI workgroup Chris Tipa, Marnie Graham, Sue Medson, Helen Taylor and Paul Patten.